Automatic Toyota Camry with 14 inch wheels, AUX audio in, tuner/radio, black on the outside, beige interior. Imported spec Toyota with Tinted windows, 19″ wheels and Spoiler. Price reduced! Opportunity! A 2013 grey/silver Toyota Camry now available at a reduced price. Red 2015 sedan. Beige interior. It features ABS, 16 inch wheels and airbags (front and side). Imported spec Toyota with Power windows, 17″ wheels and ABS. Price reduced! Imported spec Camry from 2010 for AED 22,000 with a 4 cylinder engine. Grey/Silver sedan with silver interior. It has AUX audio in and sunroof. GCC spec automatic, 16 inch wheels, fog lights, CD player, beige interior, white exterior. GCC spec Toyota with Airbags (front and side), 18″ wheels and Power locks. Price reduced! Automatic Imported spec Toyota Camry with 16 inch wheels, air conditioning, ABS, beige interior, white exterior. 2016 Toyota with power windows, CD player, air conditioning. White with beige interior. 4 cylinder white 2018 sedan. Red interior. Front wheel drive, 18 inch wheels and CD player. Grey/Silver 2019 sedan for AED 60,000. Black interior. It features tuner/radio, 18 inch wheels and air conditioning. This is a white sedan with beige inside and air conditioning, tuner/radio and 18″ wheels. Automatic 2018 Toyota Camry with 18 inch wheels, ABS, tuner/radio, red interior, white exterior. 2019 Toyota Camry white sedan, red on the inside with tuner/radio and air conditioning. 18″ wheels. 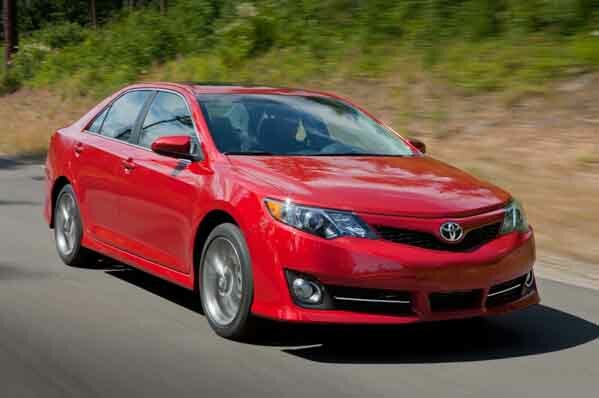 What are our customers saying about the Toyota Camry in Dubai, UAE? Narain - Perfect car to buy for first time drivers, good price, easy to drive and cheap to maintain. Resale is good too, I've only had the car for a few months, and people keep trying to buy it from me. Pros: Resale value seems reasonable, good first car, can fit five adults and there are plenty of used Toyota Camry for sale in UAE. 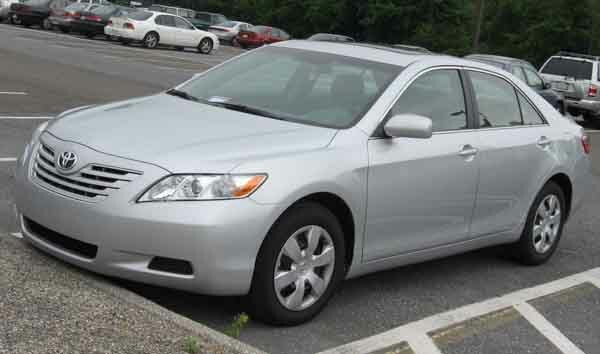 Mohammad - Second hand 2010 Toyota Camry is a very good car to drive, good fuel economy, comfortable and lots of space. I would recommend anyone to buy this car. Some small pieces are coming off inside, but it’s nothing glue won't fix. Pros: Lots of space, good fuel economy and quiet ride. Cons: Some of the interior pieces are coming off. Andy - I drive my pre owned 2006 import V6 Toyota Camry every day to work, and over the past few years, i’ve had no major problems to report. There is a small sound coming from the left side, but it’s not a major issue. Would highly recommend. Pros: Very reliable cars and with the V6 it’s got some power. Cons: No manual V6 option. Dubai and a few other Emirates include them in their taxi fleet which can only mean one thing, reliability. Next time you get in a Dubai Taxi, take a peek at the odometer you’ll see well over 100,000 km. Everybody loves a pre-owned Camry, whether you are in the GCC or not, it’s an extremely popular car. Finding a buyer is simple, even in the export market. Even though it may have soft steering in particular models, the ride is smooth. No wonder they are used to chauffeur people from destination to destination. Ever seen a Dubai cab refuelling at a petrol station during the day? No, me neither. Either they fuel up only at night, they have a super secret filling station we don’t know about, or they are very efficient when it comes to burning fuel. The latter seems most obvious. Space, space and more space. Especially later models. They’ve got huge boots to put erm…..stuff in such as groceries and whatnot. Debuting in 1982, the Toyota Camry has gone on to win numerous awards in the GCC and around the world and has been the “it” sedan to buy for ages. It’s considered a luxury sedan in some countries and currently outsells its rivals year after year; this includes the Nissan Altima, Honda Accord, Mitsubishi Galant and Ford Fusion. The Camry even takes part in motorsport and won the Premier series Nascar championship in 2015. One concept was also produced with a V8 engine and was a study for funny cars. 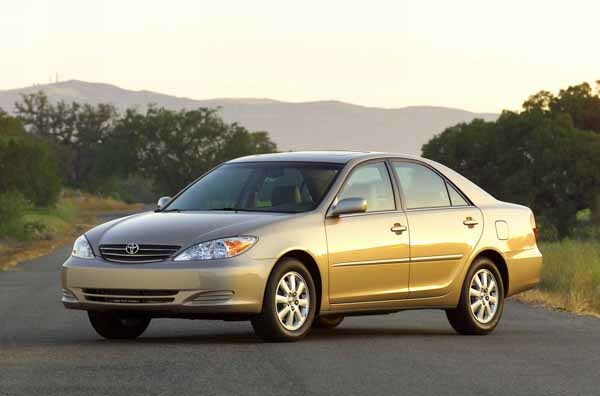 Rolling into the 2003 model year, the Toyota Camry grew and received a whole new look, which was necessary to keep up the fight with its rivals. Four trims are available starting from the XLi, GLi, Touring V6 and Grande V6. Both the XLi and GLi came standard with power windows, central locking, 15-inch steel wheels, air-conditioning and fabric seats. Touring and Grande trims add a rear spoiler, aluminium wheels, fog lamps and ABS. Top V6 trims have even more options including a moonroof, cruise control and keyless entry. All models come equipped with front airbags and lots of space. Two engine choices are on offer either a 2.4-litre four cylinder petrol engine hooked up to either a 5-speed manual or 4-speed automatic gearbox generating 154 horsepower. The other option is a 3.0-litre V6 mated to a 4-speed automatic gearbox and is rated at 190 horsepower. With more aerodynamic body, it wasn't just the exterior which received a major overhaul, everything else from the ground up did as well, and it was a good idea as it shares the underpinnings with the Lexus ES 350. Models during this year came standard with fabric seats and radio/tuner. Optional extras included electric front seats, aux inputs, automatic windows, leather upholstery, front and side airbags, alloy rims and a host of more options. With Grande and Touring moniker’s dropped from the lineup, Toyota added a “Sports” model which features a body kit and stiffer suspension. The V6 engine was dropped in the GCC regions which seems like an odd thing to do seeing as we love power and fuel is relatively cheap. One engine of choice this time around which is the 2.4-litre inline four cylinders 158 horsepower motor sending power to the front wheels via a 5-speed manual or 5-speed automatic transmission. Mid way through this era, saw a light refresh and the re-introduction of the Touring badge now known as SE. Due to many riots and outrages (not really, just a lot of people asked) 2012, saw the return of the manual transmission and the Toyota Camry went under the knife once again for a complete overhaul. Now with a new engine, suspension system, interior and body, Toyota desperately tried to re-invent the Camry which they did. Now available in six trims; Base, S, SE, Plus, Sport and Royale in no particular order. Base models have their own unique bumpers, fabric seats and 15-inch rims. S models came with air-con, touchscreen multimedia system with USB input, keyless entry and power mirrors. SE models borrows from the S trim but also receives cruise control, Bluetooth, media inputs, rear camera, electronic front seats, 16-inch alloys and fake wooden trim. Optional extras include keyless start, sunroof and navigation. Sport models sit at the very top that receives everything from the SE model and a little extra; unique rear spoiler, leather upholstery and 17-inch alloys. In Oman for example, this model also has remote engine start. In 2014, two trims were added to the lineup. Limited models featured leather seats, rear camera, chrome grille, spoiler and navigation. RZ models were limited production models featuring RZ decals, 17-inch black gloss rims, sports suspension, blacked out grille and spoiler plus unique headlights. One 2.5-litre four-cylinder petrol engine is on offer, paired to either a 6-speed automatic or the returning 6-speed manual transmission. 178 to 182 horsepower is sent to the front wheels and allows for a top speed of 195 km/h. Again, Toyota brought new life to the mid-sized sedan. With re-profiled front and rear end, four models are on offer this time around. Starting with S, manual A/C, keyless entry, rear parking sensors and touchscreen media with USB input is standard. SE models received fake wooden trim, 17-inch rims, dual exhaust, powered front seats and extras were available. SE Plus adds a sunroof, stability control, keyless start and navigation. The highest spec known as Limited or Sport keeps all that and adds paddle shifters, leather seats and fake metal trim. There is another model available soon, known as the XSE; it’ll have dual exhaust tips. In regards to safety, all models receive front airbags. Once again the manual transmission fades away into oblivion as a 6-speed automatic gearbox is the only choice to send 182 horsepower to the front wheels. Displacement and the number of cylinders remain the same. 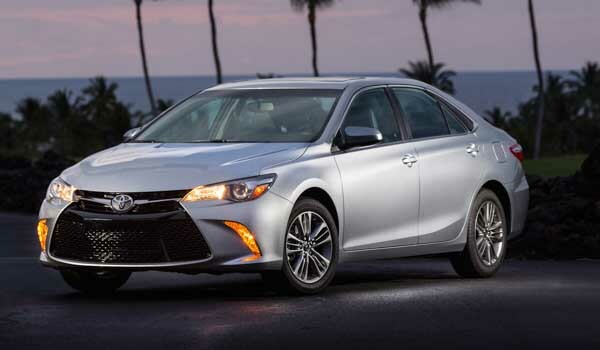 Those looking for a Toyota Camry XLE or LE model will have to import one from the United States. 2018 Toyota Camry models are now officially on sale across the UAE. 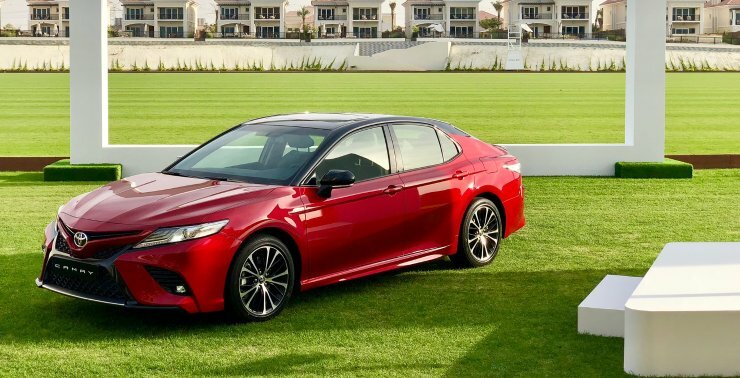 Entering its eighth generation, the latest Camry offers customers five trim levels to choose from. Starting with S, SE, Grande SE+, Grande Sport and the range-topping Grande Limited. Built on a new, stronger platform, Toyota has filled the options list up giving customers a wide range of creature comfort features to choose from depending on the trim. Just to name a few, an eight-inch multimedia interface with navigation, wireless phone charger and a seven-inch infotainment screen wedged between the dashboard gauges. On the safety front, the 2018 Camry is available with six SRS airbags, Anti-lock Brakes, Brake Assist, Hill-start Assist and a stronger body to keep all occupants safe and secure. Once again, the 2.5-litre four-cylinder engine is available, and for the first time in ten years, the 3.5-litre V6 is back on the menu. With 298 horsepower driving the front axle, we won't have to scan through dozens of ads to find that one US spec'd V6 Camry as we can once again buy a GCC specification 2018 Camry! And you can choose from nine different colours. Something still tells us that white will be the favourite still.